Last weekend's protest was part of the Right to Return Weekend in New Orleans. The Right of Return Weekend was organized in conjunction with the May month of actions called by Take Back the Land Movement (TBLM). TBLM is a network of autonomous organizations affiliated with the US Human Rights Network (USHRN) dedicated to realizing the human right to adequate housing and community control over land. Police say Ms. Sharon assaulted a Columbia Parc rental agent during her entrance into the building as part of last week's action. The rental agent did not complain about an assault and continued to work in the office the entire time of the occupation, including when police arrived. While there, police made no mention of an assault when explaining to the group why they should end their protest. 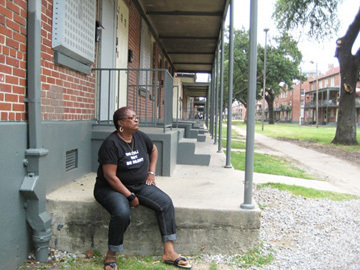 The truth is that the City of New Orleans did not arrest Sharon Jasper for assault, they arrested her because she dared to tell that truth and demand that public housing residents of New Orleans have the right to return to their homes. The arrest represents a clear effort by the City of New Orleans to represent the interests of the developers of the Columbia Parc while actively working against the displaced former residents of New Orleans.